House Speaker Paul Ryan, left, was challenged in 2016 Wisconsin primary by businessman Paul Nehlen, right. When I think of Ryan the RINO, who was among the last to support Trump and among the first to distance himself from him when the tough times came during the campaign, it is hard not to remember that his wife is a hard-core Leftist. That says something right there, don't you think? -W.E. 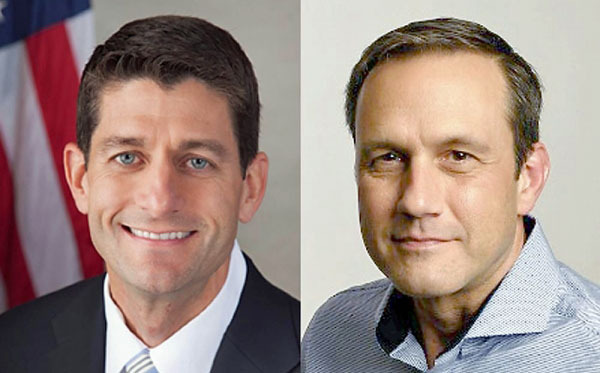 Nehlen also blasted Ryan for continuously funding left-wing priorities, even while the speaker is apparently unwilling to fund immigration enforcement and the border wall that defined the president’s entire candidacy. “Think about this – Speaker Ryan’s budgets have funded the following: sanctuary cities, dangerous refugee resettlement, illegal alien orientation and resettlement, the release of criminal illegal aliens from prison and payments used to pay the families of Palestinian terrorists,” Nehlan told WND. In his comments to WND, Nehlen largely defended President Trump and his record, though he admitted he is unhappy with some of the personnel decisions made by the commander-in-chief. Ryan has been aggressively fundraising not just for his own race but to defend the Republican House majority in 2018. As speaker of the House, Ryan enjoys not only the advantages of incumbency, but a privileged political position that allows him to leverage commitments from other Republican elected officials. Yet despite Ryan’s advantages, Nehlen remains optimistic about his chances in 2018. Indeed, he regards his first campaign as successful in achieving his real purpose – getting the United States to pull out of the Trans-Pacific Partnership trade deal. However, this time, Nehlen is aiming at an outright victory and taking his place in Congress. “I had only four months the last time I ran for the seat and was laser focused on defeating Ryan’s Trans-Pacific Partnership,” Nehlen told WND. “We were successful and President Trump signed us out of that deal his first Monday in office. But now I’ll have 14 months to really connect with residents, discuss my 30-year international business career and highlight my conservative positions. There simply wasn’t enough time last go-round. When asked what he will campaign on, Nehlen had a simple answer. He will champion the same issues that propelled Trump to the Oval Office.